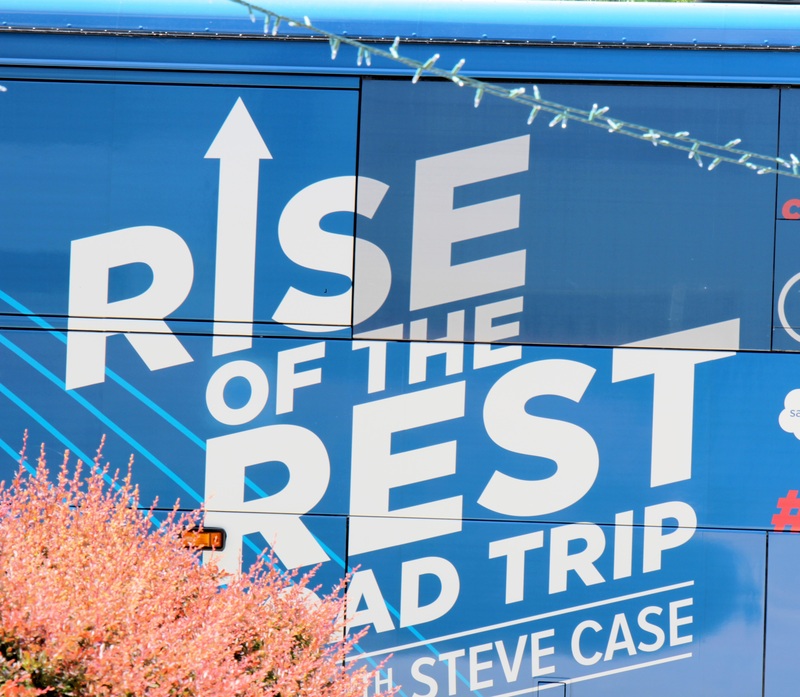 On Tuesday, AOL co-founder Steve Case visited the Triangle as part of his Rise of the Rest tour. His itinerary could have matched that of a politician on the campaign trail, with all the stops he made. First up, a meeting with the Gov. Pat McCrory. Next, a stop and a talk about HQ Raleigh (we heard he even held a baby!). Then, Steve headed to The Frontier in Research Triangle Park. This stop was (obviously) very exciting for all of here in RTP. It was pretty exciting to have this dynamo in 800 Park Offices Drive, and our event was structured a bit different than others around. RTP often talks about our relationship with our surrounding universities, and today was our chance to show that off. 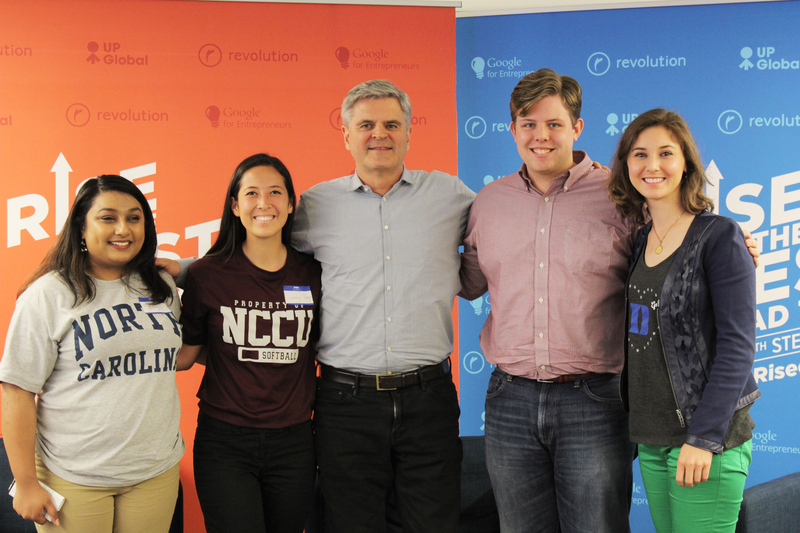 Instead of Steve just talking to the audience, he was interviewed by four students from area universities (that were in the midst of finishing up finals): UNC-Chapel Hill, Duke, NC Central and NC State. Each student interviewer was hand chosen by university faculty to represent their school’s entrepreneurial spirit. 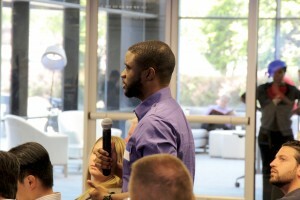 After the students had a chance to ask their questions, Steve opened it up to the audience. Questions ranged from how companies get crazy valuations (looking at you, Snapchat), to advice on reading material that would be great for early stage entrepreneurs. Throughout all of the questions, Mr. Case gave thoughtful answers that didn’t belittle, and were inspiring. The event truly had a sense of “no question is a dumb question,” and that he really was interested in helping to uplift those in the room. The need for collaboration Steve spoke about seemed like a great point of validation for our region. The Triangle is a place that prides itself on being collaborative and working towards the greater good. It seemed as though out of all the advice Mr. Case gave, he continued to come back to themes of openness and collaboration when it came to ideas. He was very clear about the fact that his idea for AOL wasn’t just his, and that it took almost 10 years for it to catch on. After our lively event, Steve and the Revolution team headed to Durham. There they took a tour of American Underground before the pitch event began at the Carolina Theatre. By all accounts, this event was an amazing display of the diverse talent that resides in the Triangle. Winners, Archive Social, went home with a $100,000 check. Not too shabby of a gift to leave behind for a guy that was just traveling through, no? More than money and one on one time, Steve coming through the Triangle has garnered the area multiple press mentions. As a region, we should all strive to share these stories in any way possible. When Forbes.com, Huffington Post and The Washington Post write about the Triangle – we all win. Did I miss a media mention? Let me know! I’ll add it to the list!